Space, tranquility, solitude and the warm fuzzy feeling of total relaxation. The theme of Island Life part one. But the island can turn on you. It starts with a single small gust. Not even a gust really, just a suggestion of one, then it calms again. But you know whats coming. It builds to a roaring tempest in a matter of hours. 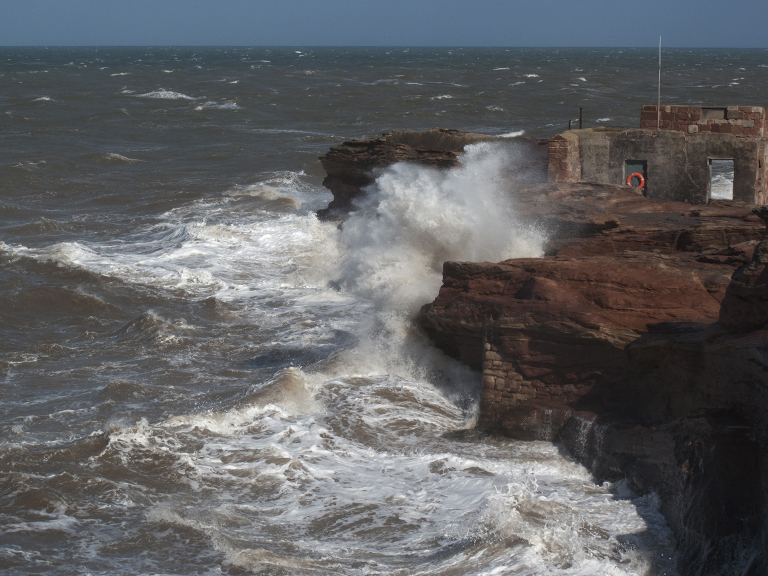 Hilbre Island transformed to a storm chasers playground. A time to retreat to the sanctuary of the mainland, to batten down the hatches and ride out the gale? Nah, get out there and into the thick of it! Waves are being whipped to extreme heights, breaking over the seawatching hide making passage to the lifeboat slip almost impossible and certainly inadvisable. So I ignore the warnings in my head and walk into the teeth of the storm. The kit is safe in it's waterproof, padded cocoon so I'm relaxed about it's safety, soon I'm more than a little concerned about my own fate. It is no exaggeration to say that it is possible that I could be blown off my feet here. I'm buffeted about by the constant unrelenting wind. I reach the shelter of the lifeboat slip with the adrenaline still buzzing through my guts. Definitely not relaxed or tranquil now. Once I have regained my composure I start to look at what's around. The reasons I'll brave these conditions are the unusal birds that will be blown in towards the coast. Stuff that would otherwise need a trip to far flung seabird colonies on remote offshore islands to see or photograph. 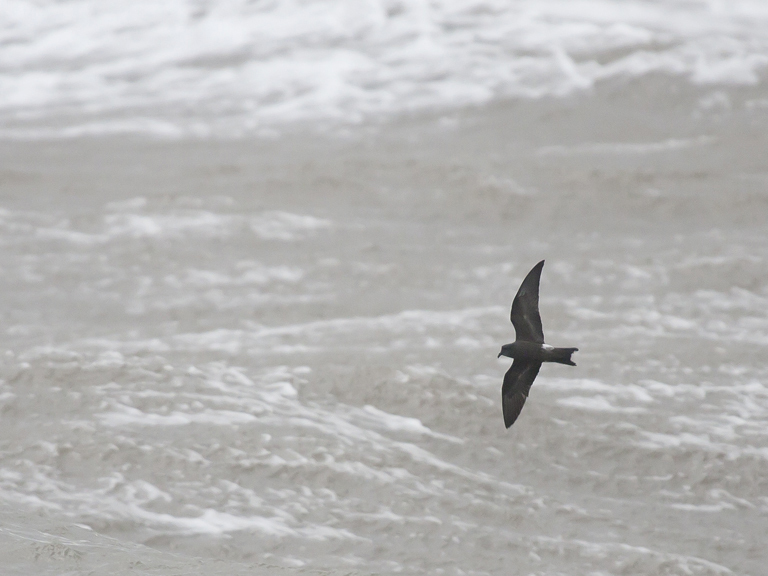 First on the radar is a Manx Shearwater. It never comes too close, and that sets the tone for the day. There is stuff about but the wind is just not quite from the right direction to bring them close. It rides the wind and skims the waves with consumate ease, the wind that caused me so much trouble walking along the island poses no obvious problems for this seabird. Further out a Kittiewake floats violently (this seems strange to say, but it is not a graceful float!) on the turbulent air as it battles towards the Point of Air. The wind turbines in the background remain at a steady spin, gears working hard in the gale. 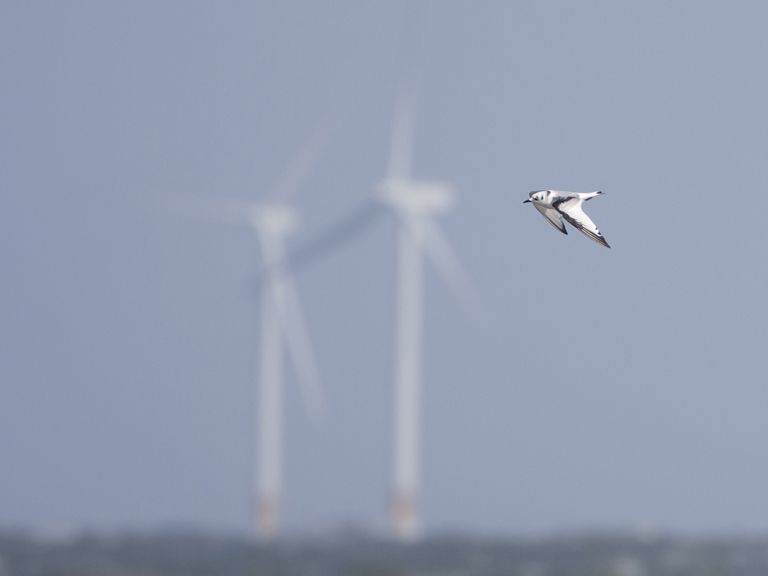 The controlled revolutions of the windmills at odds with the wild wingbeats of the normally elegant gull. 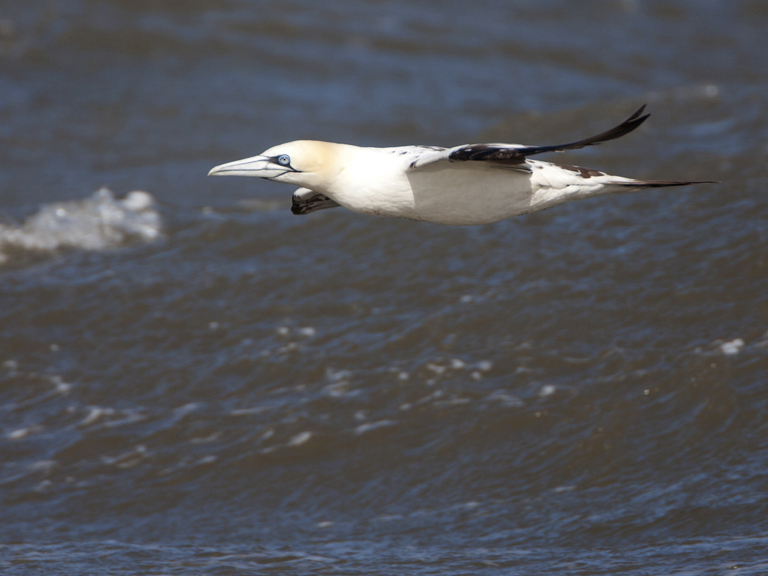 Gannets are zooming about all over the place. More than 50 in an hour, some bucking the current trend for staying distant by shearing in close above and inbetween the waves. The waves breaking over the lifeboat station are splashing my with monotonous regularity. I can taste the salt if I lick my lips. I'm feeling at home now after the wobbles of the walk down. I am tuned into the tempest and I've got my seawatching eye in. I'm looking for something in particular. A true Hilbre special. 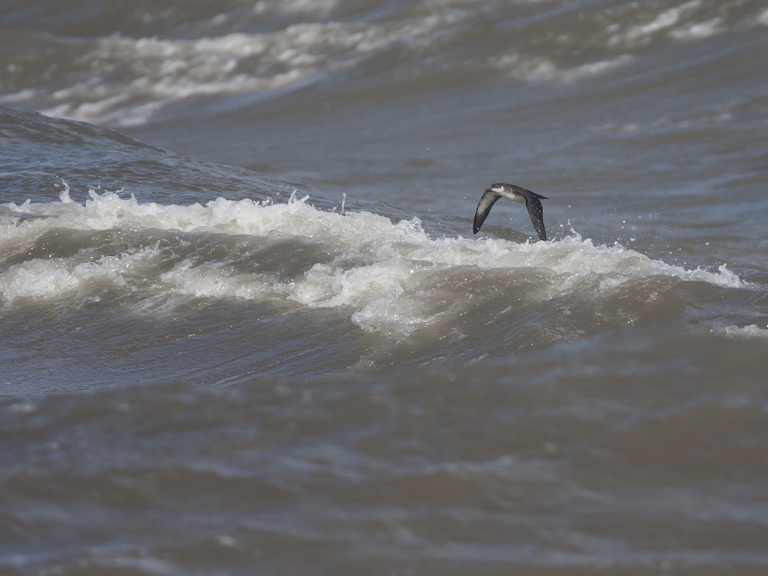 A tiny bird in the great rolling seascape before me. Sometimes they appear in good numbers but today they are few and far between. I spot one, distant, but definitely the species I'm after. It is locked in battle with the wind and waves. 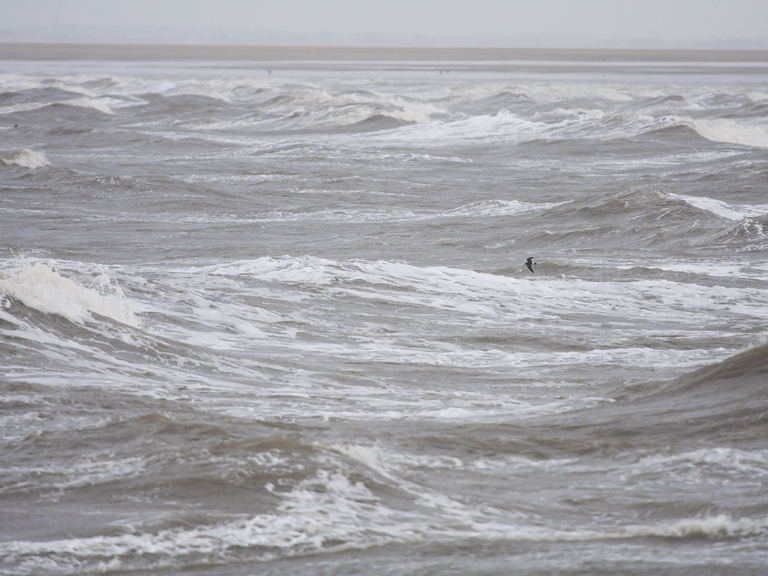 Ducking in and out of view, hugging the wind whipped surface of the sea. 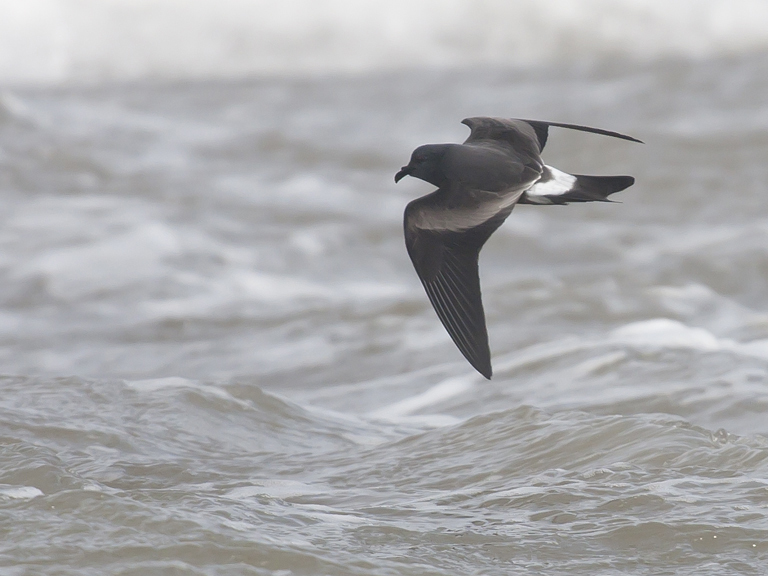 Leach's Petrel. The first picture I take is of the bird several hundred meters out. It turns out to be my favouite shot of the day. The bird is tiny in the frame but it just captured the essence of the day. Waves, wind, seascapes and the struggle of these micro-seafarers. It ignores the wind and just carries on with it's flight, for the bird this kind of storm must be run of the mill. We are all complain as soon as the wind gets up and disrupts rail, road and ferry services. This little Leach's doesn't bat an eyelid at the gale, it just gets on with it. Just one more challenge in a winter of trials on the ocean wave - no big deal. We could learn a lot from these guys. As the wind subsides and calm returns to the islands I pack up and trudge off. I get home to find that some of the roof of our house has blown off in the viscious gale. Gutted, I clear the slates from the front remembering the Leach's Petrels and I try to remain as chilled out about the storms as they do.